Product categories of Pine Nut Kernel, we are specialized manufacturers from China, Dry Fruit Pine Nut Kernel, Pine Nut Pure Red suppliers/factory, wholesale high-quality products of Wholesale Pine Nut Kernel R & D and manufacturing, we have the perfect after-sales service and technical support. Look forward to your cooperation! Pine nuts (also called pignoli) are the edible seeds of pines (family Pinaceae, genus Pinus). About 20 species of pine produce seeds large enough to be worth harvesting; in other pines the seeds are also edible, but are too small to be of notable value as human food. Our Chinese pine nuts grow in Heilongjiang and Jilin province of China. The mainly varieties are pure red pine nut kernel and cedar pine nut kernel. 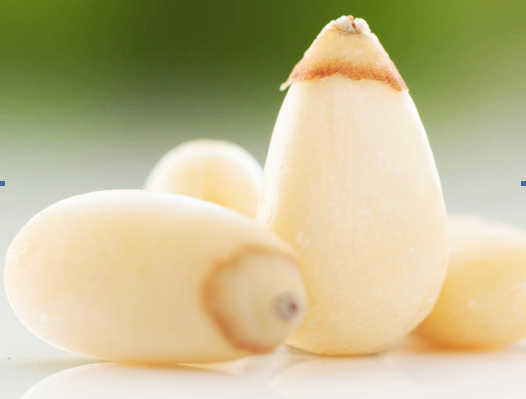 Pine nuts have been eaten in USA, Europe, Asia and many other countries. They are frequently added to meat, fish, salads and vegetable dishes or baked into bread.